ConfigMgr CB 1802 was shipped with the option of deploying the Cloud Management Gateway (CMG) via an Azure Resource Manager deployment, this was a welcome addition as it meant one less certificate when provisioning the CMG. ERROR: TaskManager: Task [AnalyticsCollectionTask: Service execmgrcmg001] has failed. Exception Hyak.Common.CloudException, Failed to get cloud service network out metrics. You can remove the failed CMG installation from the ConfigMgr console and run the setup again and will likely face the same issue. Trust me, i tried many times. I was looking into my certificates thinking this must have been a cert problem but everything seemed to be in order. As it turns out, my certificates were fine.. my primary site servers clock however was not. 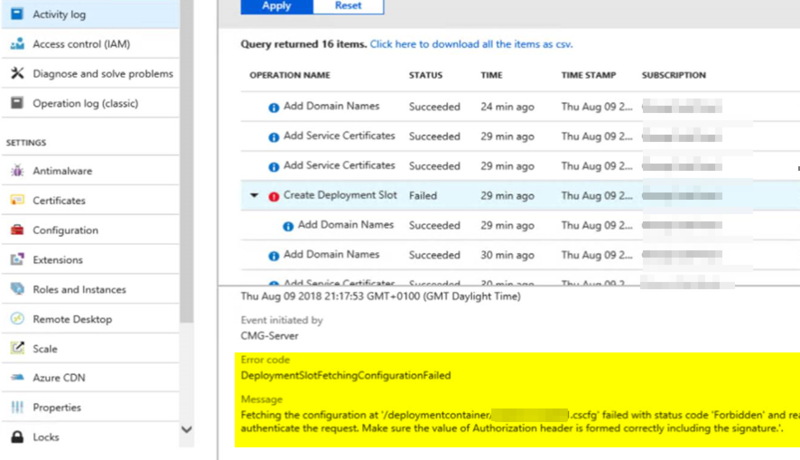 It appears the ARM deployment is VERY sensitive to any time shift between (i assume) Azure and the local server. The ConfigMgr server clock was in sync with the DC, however this was 18 seconds out of sync with my own machine, and the world clock here: https://greenwichmeantime.com/timepiece/world-clock. I adjusted the ConfigMgr system clock back 18 seconds, tried the deployment again and it worked like a charm. The CMG deployed without issue. Hopefully in future releases this sensitivity to a tiny time difference is addressed. Hopefully this post helps anyone facing the same issue. No problem. Did you face this issue?